This was supposed to be an easy rest day before the start of the 2017 Sierra Challenge. I had driven my van from Telluride, CO to Las Vegas, NV where I dropped my friend Steve off at the airport to catch a flight back to San Jose. Somewhere approaching Las Vegas, the low tire pressure alarm went off. We had only about 15min left to the airport so I said I'd drop him off and then take care of it - the leak was slow enough that I wouldn't reach dangerously low air pressure in the interim. After dropping him off I pulled over and added air to the tire, then looked up for a repair place. It was after 6p and all the places I checked online were closed. I decided to continue driving north on US95 to the White Mtns where I was to meet Jim the next day, stopping every 45min or so to add air to the tire. When I got to Westgard Pass I pulled over for the night, first jacking up the car to take pressure off the problem tire. In the morning I attempted a repair with the kit I carried, but it was still leaking slowly. I ended up driving to Bishop where I got a used replacement for all of $35. Good deal. Jim met me in Bishop shortly thereafter and we drove together in the van back up to the White Mtns to climb Peak 10,940ft near the Shulman Grove. 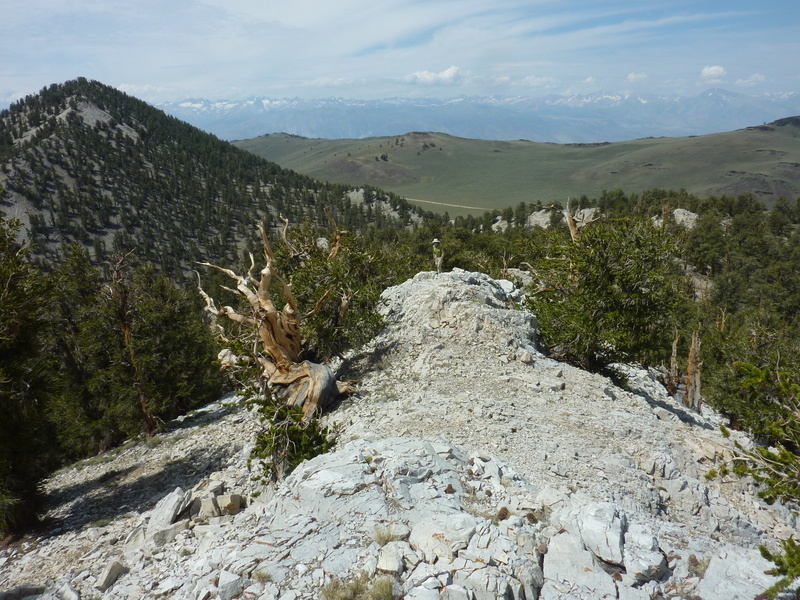 I had somehow left this out of my last few visits to the White Mtns, a minor peak that happens to land on the "Non-Sierra 10K-foot CA Peaks" list which is about as obscure a list as one might concoct (it wasn't my idea, but I became intrigued with it). The hike starts about half a mile from the end of the pavement where there is a small turnout the Forest Service has provided for parking off the rough dirt road. The hike is less than a mile each way, clmbing about 600ft in the process. The going is fairly easy, a flat walk across low desert scrub to start, then up through lightly forested terrain with good footing, eventually scrambling over several rocky class 2 false summits to reach the highpoint. The summit is located about half a mile northeast and slightly lower than Clem Nelson Peak (also known as Cold BM). There are nice views overlooking the east side of the range but the views were quite hazy today. We found a register left by Greg Gerlach and signed by Bob Sumner and Craig Barlow, two others working on this odd list. We spent some time at the summit debating the accuracy of GPSr's in determining elevation, but since neither of us had any real expertise it was mostly just wasted air. We spent a little over an hour on the entire outing before heading to the nearby Visitor Center to check out the bristlecone exhibits there. On our way back down to Bishop, more car trouble ensued. The brake and battery indicator lights came on while descending White Mtn Rd, and then on the drive between Big Pine and Bishop we lost power for a time before getting the van to limp its way into Bishop. It seems the alternator might be faulty. Not exactly the "fun" I was hoping to deal with during the Challenge, but as I like to say, "It is what it is."